Ask a gay guy what his favorite underwear brand is and he's sure to have an answer. And there are many underwear brands popular with gay men, from the brands by gay men for gay men to the popular brands. Italian maths professor turned model Pietro Boselli is making waves this week with his latest down-to-his-undies photo shoot. Pietro has signed on to Bench/Body out of the Philippines, and the first images have left us breathless. 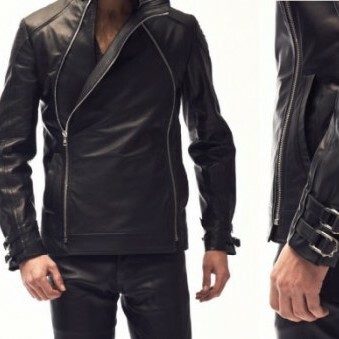 Boxer Barcelona, and their hot leather styles, is a new discovery for me, and I look forward to getting some of these leathers against my skin. In addition to the ever popular sporty trackpants, they have an amazing short-sleeve matching hoodie, baseball shorts in two lengths and a perforated tank-top shirt. Joining Jockstrap Central's huge collection of jockstraps & briefs are four new stunning PUMP! micro-mesh tank-tops along with four new matching jockstrap styles. While we missed Northbound Leather's last fashion show, the new looks are now available to buy in their Fresh of the runway collection. The new looks range from formal to fetish with a little bit of avant garde in between. I took a trip to Paris last weekend just because I haven't been in months and I just wanted to soak up a little Parisian energy. I went on a mission, first to try a new hotel that's one of Paris' best kept secrets (more on that later) and to see what Parisian men are wearing this winter. Classic 1960s British clothing brand Ben Sherman has released its' summer 2013 ad campaign starring two young models, including Jack Vanderhart, in a retro 60s styling (with an American seaside setting). The styles are typically Ben Sherman, distinctly British mod that screams "English summer". And the models are quite hot too. Men don't get away with wearing much leather beyond the acceptable leather jacket. To do so, you are still seen as a rebel, someone outside the norm. There is the everyday look and then there are the fetish scene, to which the outfits will vary. There are jockstraps and then there is underwear with even less material. The Rufskin Le Sac super minimal men's underwear is the most minimal of underwear consisting of just an elasticated waistband with a cotton front pouch that is elasticated around its edge, and Le Sac made from 95% cotton and 5% spandex. Le Sac stays in place as the elasticated pouch edge sits under your package, and Le Sac underwear has no back straps like a jock strap would so you are completely free.